December 20, 2002 A Christmas tree seems to have sprouted on the hardtop, and already new cookware and galleyware is piled underneath. Several overgrown children like to eat lunch up there in glow of the lights. 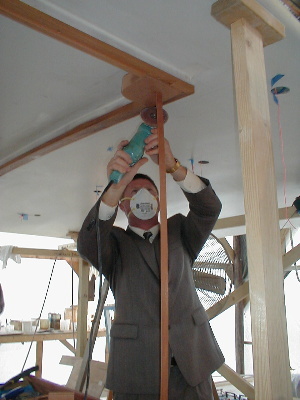 Leonard, earning “best dressed craftsman of the week” award and trying to impress Santy Claus, is touching up a little spot to get it just right. (Santa’s watching you, Leonard.) 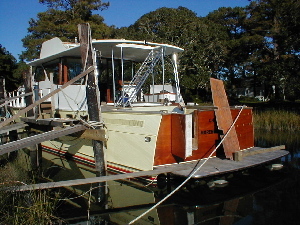 Pictured to the right is the upper attachment block for the aluminum column that will support the hard top at the rear of the pilot house. 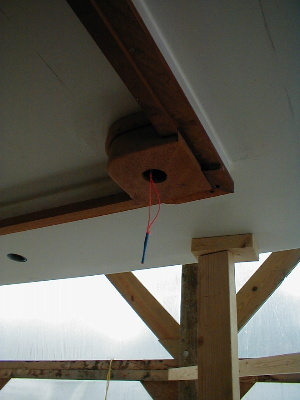 The orange string is used to pull wiring through all of this support structure after it is in place. 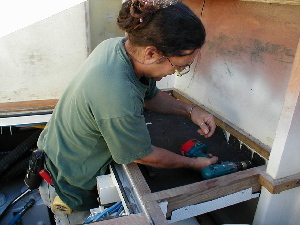 Welder Kevin Dumont is fitting his weldments in the pilot house (below left). The aluminum columns are made of two-inch polished anodized pipe. 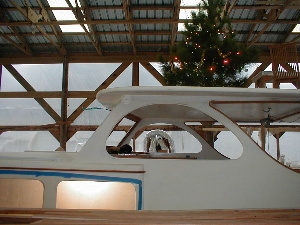 These columns will provide most of the support for the hard top roof, plus allow the many pairs of control cables and radar antennas to pass from above to the helm below. 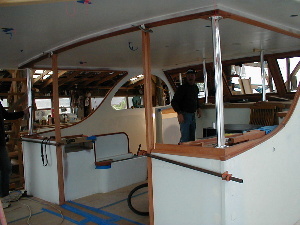 Below right, the first two columns of the fly bridge stairway are shown here with Steve Gilpin in the background making up more cables for the engine room. 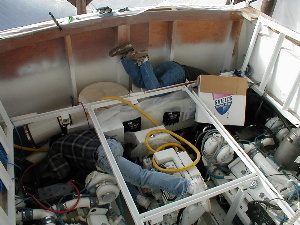 Above, Steve and Leonard still try to fill every nook and cranny of the engine room with stuff. Battery chargers, vanner equalizers, d-deck controllers, banks of batteries and backup banks of batteries, battery switches, data cable, and hydraulic lines are just a few of the things required to make everything work. 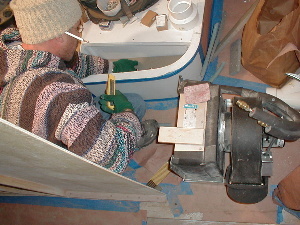 Below, Chris customizes duct work in the guest room, V-berth, laundry room, and the two heads forward. Divinycell left over from the hard top construction was used to build register boots and manifolds for the air distribution system. Recently, the five rooms and hallway forward have received the majority of the sanding and painting effort. Jeanette is shown here climbing out from below the rope locker. 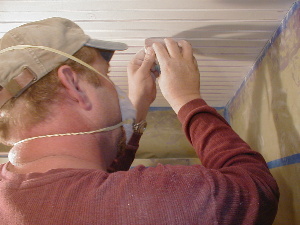 She, Kerry, Bill, and Chris have been cleaning, masking off, and sanding the many grooves and beads in the ceiling. “Now, Norman! Now, Thomas! Now, Jeanette and Chris! On, Leonard, you’re doing a good job with this! Now sand away! Paint away! Work till you’re through!